Akshay Kumar has squeezed in some family time, before he plunges into his next film. The actor has decided to accompany son Aarav to London, where the latter has secured admission in a college. While the star kid is getting ready for his further studies, Khiladi Kumar is seeking to spend some quality time with his son before both of them get busy with their respective duties. On the professional front, Akki will soon be seen in a negative role in ‘2.0’, co-starring Rajinikanth. The actor is also shooting for the fourth installment of the hilarious series ‘Housefull’, which is to release soon. 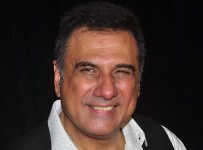 Boman Irani becomes a grandpa!